· “Well Jesus rose from the dead on Sunday, that’s why we go to church on Sunday and keep Sunday instead of Saturday, to commemorate the resurrection.” I do not know who made that up, but Yeshua rose on Saturday, the true Sabbath. John 20:1 says that Mary Magdalene came to the tomb “early, when it was still dark” when the “first of the week cometh” that would be Saturday night sundown. Remember we Jews reckon a day as from sunset to sunset. Therefore, this would mean Yeshua rose sometime on Saturday. · Sunday Worship; Pagan: Sunday worship has its roots in paganism, the worship of the sun god. Ezekiel 8:16-18, actually deals with the ancient “Easter” sunrise service, and sun worship. A pagan act in ADONAI’s Temple of all places! What blasphemy! · Is it wrong to worship God on Sunday? No, we can and should worship Him every day of the week. Just do not go worshiping Elohim on Sunday and call it, or pass it off as the Sabbath. · Life over Law: Police, Fire, Rescue, Military, and Medical: Okay to work, try to have a rotating schedule so you can get most Sabbaths off. · No business of money changing hands: No shopping or eating out, do not make others work. · Make all preparations beforehand: Cleaning, Preparation of food, etc. · Dress Best: People and Table: Find clothes and fine dinnerware. 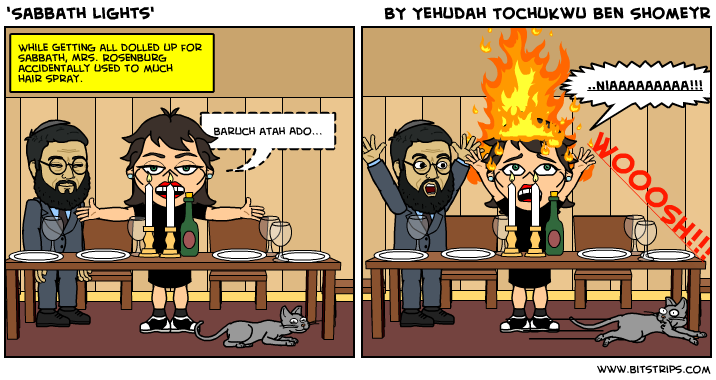 · It is usually the women’s responsibility to light the Sabbath candles, but if no women are present, it is permitted for a man to light them. According to the Talmud (Shabbat 31b) since it was the woman who caused mankind’s downfall by eating the forbidden fruit of the Tree of Knowledge offered by the serpent, thus causing the spiritual light in this world to dim, therefore it is the woman’s duty to light the Sabbath candles.